I should state at the outset of my review that I am a white, 46 year-old, educated, public special education teacher who happens also to be a man. I am a Christian and I have bachelors degree in theology and bible teaching and a masters degree in education. I am a public school teacher as a second career so I am not very far up the pay scale and thus I am, by definition, not-wealthy. Finally, I am married and have children. I want to dispel, at the outset, any of the concerns my readers may have about whether or not I am biased or prejudiced in any way at all. Well…I suppose I am. I suppose everyone has a fault or two they have to reckon with in this lifetime while they work out their salvation with fear and trembling. Reading this book, I got the sense that Ms Harper has all the sins of everyone in the world pegged–and there are a lot of sins to reckon with according to her, plenty of guilt to go around. I am not entirely opposed to her pointing out sin–preachers, good and bad alike, do that. The problem I had with this book is that the majority of sins in this world have, evidently and only, been committed by a very small minority of people; namely, rich, white, men in positions of power. And as I read through the book as a relatively poor white man, who has evidently been handed everything in life because of my relatively pale skin color, I couldn't help but wonder if the solutions to the world's problems would go away if all the white men who have exploited black people and poor people and the environment and women and other minorities; who have schemed and exploited and pillaged their way to economic prosperity; who have never suffered at the hands of anyone; would simply repent or, well, die. The subtitle of the book is 'How Everything Wrong Can Be Made Right.' This is audacious to say the least because her solution has very little to do with what Paul describes as the Gospel in 1 Corinthians 15:1-11. What is more amazing, however, is that as I read through the book which is thick with what some might call the 'Liberal Democrat Presidential Platform,' is this: there are people all around who think that her solutions to the problems she describes can be solved in better, less blame-assigning, guilt-compounding, accusatory ways. What is amazing is that someone who would agree with her every single jot and tittle has been president of the U.S. of A. for the last seven and a half years–and yet this book was still deemed necessary. The policies she would champion have been the policies of this nation for nearly eight years…and yet this book was still necessary?! You may well have guessed that I didn't like this book. I will give a few reasons for my dislike. (I assure you my dislike is purely philosophical and theological.) Aside from the pretense of being a book about 'solutions' when it's really a book about 'blame', Harper has an a prior commitment to a view of Scripture that I don't think most conservative Christians readers will find helpful. For example, she dates the book of Genesis as "the youngest of the first five books of the Bible, like written just after the fall of Babylonian empire and at the end of the exilic period (ca. 538-450 BCE)" (18). Throughout the book she will use short phrases like 'most scholars now believe' (e.g., 143). This is misleading, at best, because it depends entirely upon which 'scholars' one reads. Among her favorites are Gerhard von Rad, Walter Brueggemann, Phyllis Trible, and Jim Wallis–none of whom are recognized for their theological or canonical conservatism. It is easy enough to find a host of Bible scholars who can produce compelling linguistic, archaeological, theological, and historical reasons for early dates of important Bible books like Genesis (and, furthermore, demonstrate compelling reasons why such books as the Pentateuch are not scraps cobbled together by some imaginary priestly class but are unified wholes written with a singular purpose, by a single author). Another problem with the book is the constant whining. She constantly laments the slavery history of the United States. Yes. We all lament it. It is a terrible aspect of our history. Yet: "At the same time, the God-shaped abyss in my soul was hungry to be filled. Born black in a white world, a woman in a man's world, I became a child survivor of bullying, sexual abuse, and divorce. I was lost and trying my best to be okay" (61). Or, "I suffered the humiliation of being placed in general-education classes even though I had been in the highest reading group in a competitive class in Philadelphia" (55; the students in my special education class would not think being in general education a humiliation; nor would the 98% of the population who also 'suffered' in GE). But seriously. Everyone has had to suffer. I am a white man and no one has handed me anything. I was bullied as a young boy and worse. I grew up poor. I'm still paying for my education. We all have a history. But I submit that my suffering is no worse than hers; and hers no worse than mine. It's different, but none of it is beyond the hope of Jesus. Part of the glory of belonging to Jesus is that we are not defined by our history, but by our future. 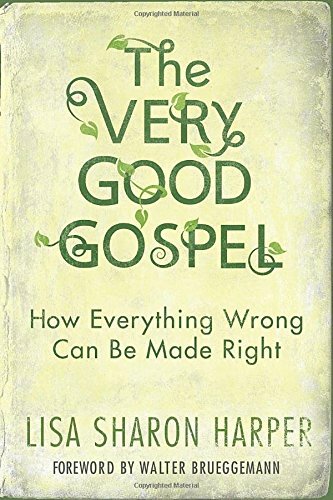 A significant part of the problem with this book and its underlying assumptions is that it is mired in the past, seemingly unable to think about Jesus has, indeed, set us free. We are called to forget what is behind and press on to what Messiah has taken hold us for. Kingdom making means acknowledging sin and repenting, making recompense when necessary, and pressing forward in hope. It doesn't mean dwelling in the past or oppressing people with guilt for the sins of their fathers. Enough of the problems with this book. I assure you I can go on for another thousand words, but I won't. My point in highlighting these points is to note that her arguments are open to interpretation at best and specious at worst. I am simply an optimist and this book is far too rife with blame and accusation to be of any useful optimistic hope. I think it will appeal to a certain part of the population, but I think many folks will see the logical holes, the fallacious arguments, the distorted history, and the misappropriation of Scripture and put the book down. Or never buy it to begin with. I do want to end on one positive note. Of all that I have criticized, and I assure you I have more that I want to say, I did find chapter 10, "Shalom Between the Nations" to be an exceptionally well written and compelling chapter (aside from her application of Jubilee on pages 169-170). Here I think that Harper gets it right when she talks about the way 'empire' has corrupted the vision God has for this world in Jesus. She has some excellent observations about how 'war' and 'empire' are mentioned together early in the Biblical narrative (165) and how our leaders tend towards corruption and oppression. I thought she also had some rather brilliant thoughts about how the problem of 'empire' can be salved, "God has broken into the universe to disrupt the reign of humanity. A confrontation is brewing between the dominion of humanity and the dominion of God. God will confront the rulers of this world in the person of Jesus" (174). I think the confrontation already happened at the cross and in the resurrection. Nevertheless, this is, in my opinion, the best paragraph in the entire book. Sadly it doesn't make the book worth buying. There are twelve chapters, a forward by Water Brueggemann, a conclusion, and end notes. It begins with a short 'study' (chapters 1-3) of the early chapters of Genesis and then drives into a more practical and political application of what Shalom will look like in areas such as self, gender, creation, families, race, nations, and God himself. Each chapter concludes with a 'Reflection Exercise' where we are invited to do things like support the Paris agreement (115), support Black Lives Matter (156, 160 #6), and listen to the stories of women (99) among much else. The problem is that this is not a book of Good News, Gospel. It is not a book about how the death and resurrection of Jesus already confronted the world and how through it God has begun to set things to rights. It's a book about all the things that Harper perceives as injustice or inequity in this world and her leftist political agenda for fixing them–I dislike the terms 'leftist' and 'right wing', but for lack of better terminology at this point, I submit to their use. I don't think we can have it both ways: the government cannot at once be the problem and the solution. If the Gospel is the solution, then the solutions will come one person at a time. Slowly. As a mustard seed takes root. In some cases, she is correct in her identification of the problems, but misses the mark entirely in her solutions. And if I as a white, 'privileged', man have my biases, it's hard to see how Harper has none. I read a lot in this book about how she has been humiliated, shamed, or treated unfairly–none of it is right or just. I agree. But I read very little, if anything, about her own culpability. Everyone in the book is guilty: Abraham. David. Solomon. Cops. Ben Franklin. White men. Adam. Her parents. And many more. Everyone seems guilty. Except her. Disclaimer: I was provided a free copy of this book via the Blogging for Books bloggers review program in exchange for my fair and unbiased review.